The New Warriors are the latest additions to the Marvel Cinematic Universe, as the show recently got a pick-up from network Freeform. Squirrel Girl was previously announced as the lead character, but now Marvel made the team's entire line-up official on Wednesday, via USA Today. The teen dramedy will include six superheroes from the Marvel Comics universe, most of whom have a canonical history with the team. The New Warriors debuted in 1989's The Mighty Thor #411, shortly before debuting their own book, which launched in 1990. The team was Marvel's attempt at creating their own version of DC Comics' Teen Titans, by making a team of teenagers that consisted of well-known heroes, plus one brand-new character that they hoped would be the breakout star. The original line-up included Firestar, Marvel Boy, Namorita, Nova, and Speedball, and added in the newly created Night Thrasher. The series lasted 75 issues (no small achievement), but never became the runaway hit Marvel wanted. Several other attempts were made to revive the team over the years, but none lasted more than 20 issues total. The most notable of which was a six-issue mini series that featured the team as the stars of their own reality TV show. 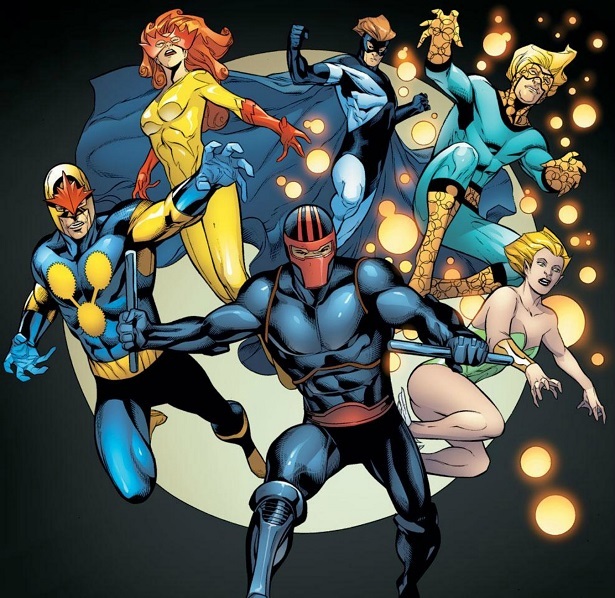 In this version, Night Thrasher, Nova, and Speedball were joined by new characters Microbe and Debrii. This version of the team has a notorious reputation in the Marvel universe, because their televised fight against a group of super villains in Stamford, Connecticut resulted in the villain Nitro exploding, killing 612 people in the process, including several members of the team and dozens of innocent children. This incident was one of the sparks that led to Marvel's "Superhero Registration Act," and the event series Civil War that followed as a result. Interestingly, Squirrel Girl, real name Doreen Green, has never been a member of the New Warriors in the comics at all. But right now she's Marvel's highest-profile comedic character, boasting a huge cult following, so why not put her front-and-center on a team? Yes, her primary power is talking to squirrels, but isn't that what makes her so awesome? She was originally introduced back in 1992, but didn't make another major appearance for almost a decade. When she finally did, the Squirrel Girl cult started to form, and she became one of Marvel's most popular characters, and now has her own comic series. According to Marvel.com's announcement, Doreen is "a totally empowered fangirl. She is a natural leader—confident and tough, but not innocent. Doreen is bouncy and energetic and her greatest quality is her optimism… She has faith in others and inspires people to believe in themselves. She also takes her pet squirrel, Tippy Toe, everywhere." Sounds about right. The character most closely associated with the team, as he was created to be the team leader. As a child, Dwayne Taylor saw his wealthy parents killed right in front of him. This event drove him to train for years and become the world's best martial artist and, eventually, a vigilante. Yeah, I know...this origin story sounds a tad bit familiar to a certain DC Comics icon. Eventually, Marvel added some wrinkles the story to make it not just a Batman knock-off. The show's version of Dwayne is described as a local celebrity hero with his very own YouTube channel. He hides the fact that he comes from a wealthy family so as to not ruin his "street cred." Looks like the TV show is dropping the Batman similarities. Probably a wise choice. Robbie Baldwin is the one character on the team that can claim he was created by Spider-Man's co-creator. Yes, legendary artist Steve Ditko created Speedball for his own series back in 1988, which was very short-lived. Luckily, Marvel salvaged the character for the New Warriors shortly thereafter. Speedball had the power to create kinetic balls of energy, and was a mainstay of the Warriors for most of their runs. In the wake of the Stamford Incident, Robbie changed his name to Penance, donning a black body covering suit that caused him pain all the time as punishment for his contribution to the tragedy. Thankfully, he ditched this persona and went back to being the goofy Speedball. The TV version of Robbie "grew up watching Quinjets take off from Avengers Tower and loves the idea of being a hero. He’s an impulsive and immature people-pleaser with a misplaced sense of confidence." That actually sounds very close to his comics counterpart. His comics costume is very silly and dated, and I hope they don't change it a stitch. Pronounced "debris," Debrii is described as a "low level telekinetic magnet." She is able to move masses of large objects that are close to her at will, and can manipulate several of those objects at once. Debrii joined the team when the New Warriors' TV producer felt that their reality show would get better ratings with a more volatile personality, and she was thrown into the mix. She was smart enough to avoid being killed in the opening shots of Marvel's Civil War by not reuniting with the team after their first reality show was cancelled. The TV version is described as "proud, funny and quick witted. Confidently out as a lesbian, Deborah has experienced deep loss in her personal life as a direct result of super 'heroics.' She can take care of herself, or at least says she can. She’s the one who calls people on their BS and has no fear of putting her opinions out there." Another character that sounds pretty identical to her comics counterpart. In the comics, Microbe, a.k.a. Zack Smith, has the power to communicate with germs and other microscopic organisms. His father, a prominent doctor, thought he had discovered a way to cure previously incurable diseases. As it turned out, Microbe had unknowingly used his powers and "talked" the diseases into acting out the results his dad desired. Now disgraced as a medical researcher, his father disowned him, so Night Thrasher took him in and made him one of the New Warriors. Like Debrii, Microbe was created for the 2005 mini-series which made the team reality TV stars. In his TV show description, they describe Zack "as a shy hypochondriac whose ability nearly makes him a telepath — the germs tell him where you’ve been, what you ate and who you hung out with. It’s impossible to keep secrets around him. He’s a big sweet guy the team takes under their wing, and they help him find and grow his own confidence." This is the one character in the line-up not created for the team or ever been a part of it, but instead was created for Marvel's comedic series Great Lakes Avengers. Created by comics legend John Byrne, Mr. Immortal was part of a group that had silly sounding characters like Dinah Soar and Flatman. In the comics, Mr. Immortal's power is as his name suggests--he just doesn't die no matter what you do to him, which I'm sure will be a recurring gag on the show. For his television incarnation, he's described as "the team troublemaker and lothario… Craig is kind of like 'The Most Interesting Man Alive,' except he’s more cocky than confident and at times, charmingly grumpy. Although Craig’s superpower seems amazing, he hasn’t made use of it at all—he’s lazy and figures if he has all the time in the world to learn how to fight, what’s the rush?" What do you think of the TV line-up of the long standing Marvel team? Do you have a favorite member missing from the line-up? Let us know your thoughts down below in the comments.